Yes, we know this was last week's 'Corona Classic Cut' at Oran Mor, but we only saw it on Saturday and it was a busy weekend. We'll try not to let it happen again. Actually no, we'll not be seeing this week's play 'Romeo & Juliet' until Saturday and with another busy weekend planned you'll probably not see our thoughts on that until Monday night either. Sorry. Selma Dimitrijevic has cut down Edwin Morgan's Glaswegian Scots translation of Rostand's classic tale to fit the 50 minute lunchtime slot by effectively reducing it to the relationship between Cyrano (Gary Collins) and Christian (Ryan Fletcher). Although the production also features Annie Grace providing a scene setting introduction and musical accompaniment, she's really rather wasted here. The brunt of making the production work falls on Collins and Fletcher who give excellent comic performances. The unfamiliar language simultaneously amuses and frustrates (even here in Glasgow) and I'm afraid I lost a good portion of the narrative in Cyrano's final speech. Dimitrijevic's direction works well for the most part, but the changes between scenes are often unclear and there's little indication of time passing or intervening events. An entertaining way to spend a lunchtime but not one that we'll remember for any great length of time. 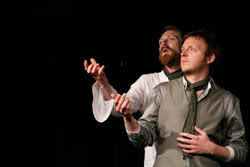 Cyrano de Bergerac has completed its run at Oran Mor. The Corona Classic Cuts series concludes this week with Romeo & Juliet.